Wow! Another year has come and gone before our very eyes! Amazing how time flies when you are covered in fuzz and surrounded by hookers…um…wait, that didn’t sound quite right! The CLF has once again shown how might the hook can be, in the classiest of ways by proving that what everyone says “can’t” be done, can and is done. You, my friends, have made me proud. We have grown from strength to strength gaining almost 2000 people to our ranks in one year! We began 2010 with 4300 minions, by March we numbered 5,000, as of today we number 6210 on the CLF HQ message board on Ravlery.com, and almost 2000 on our Facebook page! Not to mention our Twitter presence, but for some reason I keep losing followers who are named “HorneyBoyz342″…I think they don’t realise what kind of hookers we’re talking about! Besides volume, we have delivered what we said could be done. The CLF had Team Flaming Hooks in the Ravelympics, and we made our members proud earning many medals! We partied like it was 1999 all through March during our co-sponsored NATCROMO party on Ravelry.com. As always the FreeForm game was a hit! April 19th 2010 the 2nd annual Flamie Awards, showed record voting and listeners on the Getting Loopy Podcast. This summer saw a frantic Fearless Leader making sure the Crochet@Cama 2010 retreat came off, and it did! Thank you to all the sponsors, members, and our wonderful partner Center For Wooden Boats for making our retreat a memorable experience! Without the wonderful donations of cash from supporters, yarn from Plymouth, Jelly Yarns, and Premier, as well as a generous yarn donation from Coveted Yarns owner Robert Porter (Thanks Robert!!) our yarn tasting couldn’t have happened! Pinch Knitter Yarns in Stanwood was a huge supporter offering the shop on it’s day off and helping us sell registrations! Thank you to Sirkku, Perk and June! As summer melted into Fall, more donations rolled in from designers to a company known for it’s crochet supplies! Boye was wonderful enough to contact me before the retreat and offered to send us some of their hooks! WOW! What a haul! no one left the retreat without multiple hooks in their hot little hands! THANK YOU BOYE!! On top of Boye, we got a little somethin somethin when Vicki Blizzard from Premier yarns found out about the retreat on Facebook, and offered us yarn for the goody bags & the yarn tasting! THANK YOU PREMIER!!! The yarn was great, and it helped make our yarn tasting fantastic 😀 Love the sparkles! So another huge round of thanks go to: Vashti Braha (and Doris Chan!) of DesigningVashti.com, Margaret Hubert of MH Design Originals, Mary Beth Temple of Hooked for Life Publishing (and Getting Loopy Podcast), Drew “The Crochet Dude” Emborsky, Ellen Gormley of Go Crochet!, Shannon Mullett-Bowlsby ShibazGuyz Designs, Marlaina (Marly) Corbett Bird of YarnSports Designs (YarnThing Podcast), Karen Ratto Whooley of KRW Knitwear Studios, Delma Myers, Jimbo Price of Jimbo’s Front Porch, Deb Homola (Beautiful Yarn Totes! ), Lisa (Abby Normal on Ravelry) from In Stitches Emporium, Bonnie Pierce for signing the bullion hooks Jimbo made for our auction and more! Deb & Don Burger for donating some of the proceeds of the sales of the wonderful CDs at the retreat! Our Retreat was wonderful! Perfect weather, good friendships rekindled and new ones made, crochet classes that were world-class, good food and drink, laughter and song, and none of us went home empty-handed! Participants came from as far a field as Puerto Rico, New Jersey, North Carolina, Montana,Kentucky, Tennessee, Alaska, Texas, Oregon, and of course Washington State. We started the Puget Sound Scape Project, a collaborative experiential art exhibit that I hope will be ready for exhibition sometime in 2013! In December we began a new tradition called Pre Winter Crochet Week, just to move us from helpless negativity to positive proactive crochet goodness! It worked, you guys are awesome. We have also started a campaign to save our favorite crochet podcasts, Getting Loopy and The YarnThing. Here’s the deal, you know how they say crocheters are cheap? Well, pat yourselves on the back, we’re donating like fiends to both podcasts, and well YarnThing still needs more help, we’re more generous than the pointy stick listeners…hmmmmmmmmmm….cheap you say? Yay Crochet! So as you can see 2010 was a damn fine year my fellow crocheters all and I’m proud to be standing up front running with scissors and screaming HOOK ON! LIVE LONG! Remember this… Fear not the dark, for always the light penetrates to illuminate and guide us. That’s what flaming hooks are for! I have heard your cry! I have your pleas! Some of you are crying boredom, some information overload, some of you still have Post Holiday Crochet Injuries (PHCI) and even worse, the Post Holiday Malaise (PHM). What to do? What to do!? Here are a few tips that may help in any of the above cases! Everything seems same old, same old? Not likely if you’ve just come to the joys of the crochet world, but if you are a veteran, this happens. You get into a groove, and designers get into a groove and well…it can seem that your options are sparse. Here’s a quick tip for overcoming this feeling of crochet ennui without having to put down your hooks! * Doodle with yarn. You have stash! You know you do, lots of bits and pieces of fuzzy goodness that are muffled in some tote, bag or box waiting to be played with by your hands and hook! Take them out of confinement and allow your creativity to play! Swatch, doodle, play with hook sizes and stitches. You could call it “scrumbling” as the free formers do, but you could just play and rip, play and rip…cleanse your palette of the same ol’ same ol’! Try something new, learn a new technique…allow your mind to wander creatively. So many patterns, so little time, 200 wips waiting to be finished, but you want more. You are overwhelmed, you don’t know what to do next. Here’s what you are going to do!! * STOP! Stop looking up what other people are crocheting, take out a small wip and finish it or frog it. Then do another one, and another. Get a few projects finished. Those online pattern searches can wait. Dreaming and wishing is a good thing but it doesn’t get your crochet done. Woah Nelly! This isn’t good! Crochet is supposed to be relaxing and enjoyable! Did you out crochet your capacity? Andee Graves (Mama2Hands on Ravelry) is a health writer and retired Licensed Massage Therapist, counseled us at the retreat to LYB: LISTEN TO YOUR BODY!! *If you have any pain in your joints, you need to stop, drink water and stretch. You may want to put the hooks down for a little while, and contemplate what hand or wrist movements cause you pain. You may need to change your grip, or get an ergonomic set of handles. You may need to get a massage and tell them you need your neck, back, hands and arms worked on. This is serious! You do not want injuries to cease your ability to crochet! If you have any kind of numbness or pain get this checked out by a medical practitioner! So you aren’t bored, you aren’t injured, you crocheted like a mad fiend all year, and the holidays came and went. It isn’t even like your gifts were appreciated, people may have adored them…so why the let down? Well maybe it’s not the crochet at all, maybe it’s the anti-climax of the holiday season coming to the end…Like the song, “Now the parties over…” Maybe it’s like the baby blues, and when you create a lot of things…that’s alot of babies…here’s what I like to do. * Take a break for a few days. Set the hook down, and do something else. Get outside if the weather allows, go for a walk, or go shopping, buy some new yarn, or hooks, or non crochet related things even! Then, after a few days, start a project for YOU. Yes, that’s right, you’ve been making things for others for so long, that maybe, just maybe you need to take care of you and make yourself a present! Did some very thoughtful relative or friend buy you yarn? Or give a gift card? Is there something you’ve always wanted to try, or have that you haven’t done yet? Well, why not start now! Remember, we crochet because we love it…but as in all relationships sometimes things need to be approached from a fresh angle, sometimes we need a change and sometimes we need a break. But before this blog post ends….I want to inspire you further! First of all, I’m working diligently on producing our 2011 year in review video! It shall be entertaining and informative I promise! Secondly, and drum roll please…Get ready for 2011! The CLF is going places, in a big way! Are you ready for it? Are you ready to see us really become all that we can be? I’m working hard behind the scenes with a fabulously tech savvy Fairy Godmother to transform us into a “Real Boy”. That’s right, no longer shall we be a talking wooden puppet…but in the flesh and in your face! Ok..well, we’ve always been in your face… but that’s besides the point. Stay tuned!! And don’t forget to take a look at the CLF First Ever Book, available in hard copy or pdf version! Special rates still apply! You know you want it! If you didn’t notice, I try not to do a whole lot of Holly Jolly on this blog, not because I’m a bah humbug kind of gal, but because I am quite aware that for many in our community the holidays (which ever there are) can be a very sad and difficult time. Just like many other holidays, this kind of season or day that offers happy memories, often makes our less than positive experiences in life feel more raw. I know that feeling so well. Every Christmas morning I get up, and I have my yearly sniffle thinking of those whom I love very much that I have lost through distance, time or death. It’s just a wee sniffle, but I like to get it out of my system, and frankly I miss them all the time, but on special days, it is just more intense. So for those of you who do not find joy in the season, remember that each stitch can ease our tension, and that there is no shame in tears. 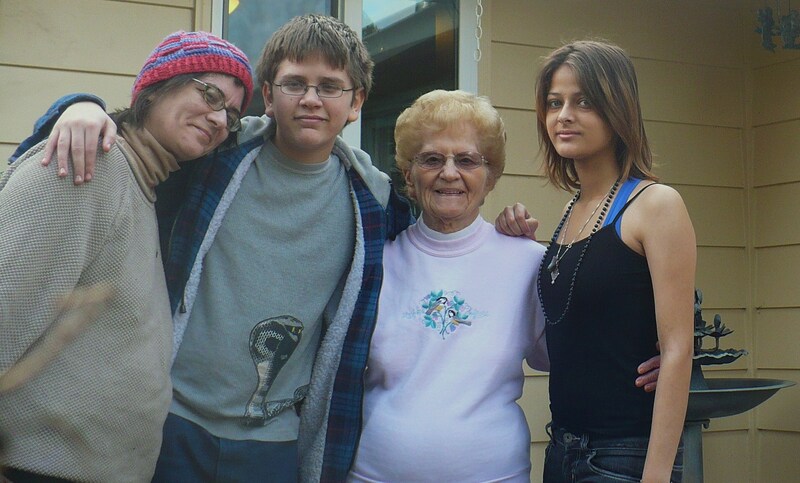 This is my first Christmas in my whole life without my grandmother, Irene, and yes, I’m a bit teary thinking of it. It has been weird not to get a Christmas card, or hear her voice on the phone, and it will be really sad on Christmas Eve, because that’s when we celebrated. I’ll crochet to move through it, well that and I’ll make her shrimp/avacado salad, cause well it’s just that damn good. Coping through loss in these festive times, can be hard. So, if you are facing a time like this please, please know that you aren’t alone. Many others are going through hard times too. Your situation is your own, it is private, it is painful, but there are those who will love and support you, even if only virtually. Crochet, cook, cry, reach out. There’s a really lovely group on Ravelry, called One Stitch at a Time. Many of the people there crochet (and knit) to help keep their sanity together, they understand. You are also welcome to post on the CLF Board at any time, because the great thing about having over 6000 members, is that you are not alone, ever. Over the past few days the internet crochet community has been buzzing about our podcasters and their fates! Podcasting is going to start to really cost, many of our beloved casters don’t want to take sponsorship in order to retain their creative freedom…which means we the listeners need to help them out! You can find Getting Loopy, host of the CLF’s Annual Crochet Awards (The Flamies), at http://www.gettingloopy.com . Reluctantly, Mary Beth Temple has put a donate now button on her site (cause the community badgered her to! We love the show! ), if you can donate please do! The Yarn Thing Podcast also faces a similar dilema, and Marly could also use donations! You can find the Yarn Thing Podcast on http://www.blogtalkradio.com/yarnthing . We need to support those who support us! If you can’t donate anything, at least help get the message out there, any help is good help! Thank you so much in advance for anything you do in this great effort to keep crochet represented on the web!